Originally found in coastal areas of Europe, marshmallow is now widely naturalised. The plant's botanical name comes from the Greek verb, altho (to heal), and it has been valued for its soothing and healing action, both internally and externally, for at least 3,500 years. As well as being used medicinally, both the root and leaves can be eaten as vegetables. 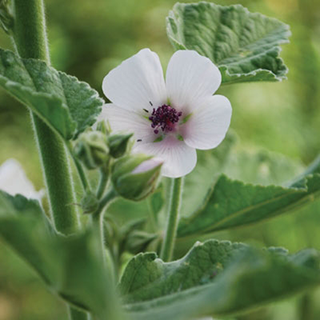 Marshmallow is a nutritive and immune-enhancing food; also a soothing demulcent to the throat and the respiratory, gastrointestinal and urinary tracts. The herb is one of the best agents employed for treating inflamed mucus membranes associated with colds, dry coughs, upper respiratory infection, urinary tract infections and gastric or doudenal ulcer. The herb promotes copious urination, thereby assisting in the elimination of toxins. Soak 1oz (30g) of root in 1 pint (600ml) of cold water overnight and strain: the result can often be very thick and mucilaginous and may need further dilution. Take 1/2–1 cup 3 times daily for acid reflux, gastric ulceration, cystitis, and dry coughs. Make a paste from 1 tsp of powdered root mixed with a little water and use on boils, abscesses, ulcers, or poorly healing infected wounds. Use to draw pus, splinters, or thorns. Drink 1 cup (1–2 tsp dried leaves per cup of boiling water) 3 times daily for bronchitis, bronchial asthma, or pleurisy. Make a syrup by combining 1 pint (600ml) of a standard infusion of fresh flowers with 1lb (450g) of honey or syrup; bring to a boil and simmer gently for 10–15 minutes. Take 1 tsp (5ml) doses as required. A small piece of a sliced dried root of marshmallow may be slowly chewed on as a specific remedy for ulcers. Prefers fertile, moist, well-drained soil in full sun; tolerates other conditions. Sow seed in trays of compost in midsummer and transplant to 3in (7.5cm) pots when large enough to handle. Plant the following spring. Alternatively, divide plants in autumn. Can self-seed enthusiastically in ideal conditions. Dig the root at any time during the growth cycle or during dormancy in autumn. Cut the aerial parts as the plant starts to flower.